In the digital age, how does government deal with rumour in a crisis? After Fukushima, the anti-rumour strategies of the Japanese government led some to question which party, the masses or the government was more involved in the dissemination of rumours. Dominant political thinking considers rumours merely a threat to be contained. But if you allow emotions into the picture, you could reach a very different conclusion, one that requires a return to Rousseau’s general will. In the immediate aftermath of the Great Tohoku Earthquake, false reports and e-mails were running rampant in Japan. Because of the power failures, there was no TV, and telephone and Internet services were limited. In particular, people had trouble getting detailed information about the current situation at the nuclear power plant in the immediate aftermath of the catastrophe. Information multiplying rapidly on the Internet through Twitter and other social networking websites, or chain-mails circulating via mobile phones, not only included calls for donations for the disaster-ridden areas, saving electricity and volunteer help for victims, but also countless so-called ‘groundless rumours’ (ryūgen higo). These rumours ranged from warnings of toxic or radioactive rainfalls, to the advice that drinking mouthwash containing iodine or eating wakame-seaweed could help to prevent any physical damage arising from radioactive iodine. Furthermore, a couple of days after the incident, defamation of foreign residents in Japan started to circulate, accusing them of looting and robbery (Yomiuri 22.4.2011), and an increasing number of residents in the Fukushima prefecture reported facing discrimination based on rumours claiming that they spread radioactivity when they travelled outside their home region. Demotix/Osakabe Yusuo. 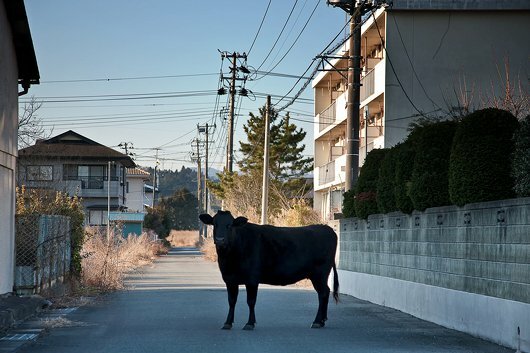 A cow roaming the empty streets inside Fukushima exclusion zone, Namie, Fukushima prefecture, Japan. Other than the interior ministry, which hasn’t revealed yet if it carried out any enforcement actions, the National Police Agency (NPA) and The Telecom Services Association announced that the authorities had requested the deletion of user statements about the manufacturers of the troubled nuclear reactors, or comments describing the earthquake as a man-made event caused by scientists or foreign terrorism. According to the NPA, until June 26 the police alone (being only one organization involved in the working team) requested the deletion of 41 so-called groundless rumours, of which 13 were actually deleted by the respective Internet providers. However, one can tell from the data published by the Telecom Services Association (Terekomu sābisu kyōkai), that this organization complied only once with these requests by the police, which was the request to delete images of dead bodies. In a second instance a poster voluntarily deleted his own statement that the earthquake was a man-made event upon being contacted by his Internet provider. Since around late-March, rumours frequently also referred to the safety of food produced in the region, especially after radioactive material was detected in a range of produce, including spinach, tea leaves, milk and fish. This prompted the government to ban farm produce, including some vegetables, mushrooms, and dairy products coming from the regions concerned. In July, when it was revealed that meat from cattle fed with contaminated straw had reached Japanese markets and was consumed by Japanese citizens, food safety concerns intensified among the people, underscoring the government’s inability to control the spread of radioactive material into the nation’s food. After these disclosures, more detailed measurements revealed that contaminated hay had been found at farms more than 85 miles from the crippled Fukushima Daiichi plant, suggesting that the radioactive fallout had reached a wider area than first suspected. Since rumours referring to contaminated food not only had consequences on a national scale, but also endangered the appraisal of Japanese (agricultural, food, and industrial) products on the global market, the government took further steps to contain rumours harming the reputation of Japan’s rural and industrial economy (in this case, these rumours were often referred to as fūhyō higai or ‘harmful rumours’). In July, the Agency for Natural Resources and Energy at the Ministry of Economy started to accept bids by telecommunication and advertising companies for a project called Nuclear Power Safety Regulation Publicity Project, whose goal was “to continuously monitor blogs on nuclear power and radiation issues as well as Twitter accounts”. More precisely, the future contractor would be entrusted with “conducting research and analysis on incorrect and inappropriate information that would lead to false rumours and to report such Internet accounts to the agency”. Based on the monitoring, the task would also be to “publish correct information in question-and-answer format on the agency's website and Twitter account, after consulting with experts and engineers if necessary”. As we learn from reports published at Tōkyō shinbun and Mainichi shinbun on July 28, it was eventually Asatsu DK, a major Japanese advertising company, which won the 8-month-contract with the agency, worth 70 million yen ($897,000). Despite being still far from any form of state-censorship and merely falling into the sphere of “administrative guidance”, the former strategy, namely the request by the interior and telecommunications ministry to delete information from the Internet, has received harsh criticism in Japan. One particularly biting but legitimate comment came from Kōno Tarō, a lawmaker of the main opposition Liberal Democratic Party. During a session of the lower house Foreign Affairs Committee on April 20, Kōno pointed to the fact that the ministry’s measures had been suspected by foreign media to be a move to tighten control over the Internet service. In particular, Kōno criticized the fact that in the official documents there was given no precise definition of what qualifies as a ‘groundless rumour’ and which information circulating as a rumour was deemed to be inappropriate or incorrect. Accordingly, it is open to mere subjective judgment to decide which information should be deleted or marked as inappropriate. Moreover, given the fact that much information provided by the government itself had proved wrong or incomplete, as was revealed in the scandal about the suppressed SPEEDI-data on the dissemination of radioactive particles far beyond the evacuation zone, government organizations, by repeating the claim that there are no immediate safety risks with regard to the leaks of radioactive materials from the stricken Fukushima No. 1 nuclear power plant, were effectively circulating groundless rumours themselves that could only deepen public anxiety. In fact, lawmaker Kōno Tarō concluded, it was no longer clear, which party, the masses or the government is more involved in the dissemination of rumours. Demotix/Osakabe Yusuo. 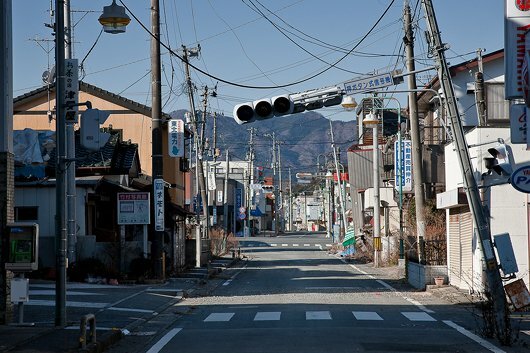 The abandoned town of Tomioka, Japan, near the damaged Fukushima Daiichi nuclear power plant. In fact, as it happens, in the Japanese language we can find a great number of different terms for the term ‘rumour’, but despite this, none of them conveys the idea of the actual social function of rumours. Shimizu Ikutarō, who analyzed rumours circulating in the aftermath of a military coup d’état taking place in February 1936 in his classic book Ryūgen higo published a year after the incident, argued that rumours are created as "cement" to fill gaps in information when people are given only mutually inconsistent fragments of knowledge that are far from enough to constitute a satisfactory and coherent view of the situation. Moreover, he argued that the government's "abstract" and "insufficient" announcements at that time even fueled the circulation of rumours. To Shimizu, rumours could therefore be considered to be ‘latent’ (senzai-teki) public opinions circulated via interpersonal communication, especially at times when the mass media is failing to provide an open space for discussion and thus the formation of a ‘manifest’ (kenzai-teki) public opinion. In a certain sense, latent publics are thus the reverse side of the process of public opinion formation described by Noelle-Neumann’s theory of the spiral of silence, which asserts that persons are less likely to voice an opinion publicly on a topic if they feel that they are in the minority, for fear of reprisal or isolation from the majority. Nevertheless, as we have seen in the case of the anti-rumour-strategy in the aftermath of the Great Tohoku Earthquake, rumours are merely considered as a threat to a society that needs to be contained. These actions taken by the government are in fact deeply rooted in the currently predominant idea of politics. Despite their important social function, described by Shimizu, emotions (such as the fear and anxiety expressed in rumours) are virtually excluded from contemporary political discourse. Politics are based on the normative model of the public sphere as proposed by Jürgen Habermas or Hannah Arendt. According to this model of a deliberative democracy, political decisions should be made merely on the basis of rational discourse. This idea, which is based on the supposed capacity of the human to found his actions on reason, is the foundation stone of our contemporary political system. Demotix/Osakabe Yusuo. 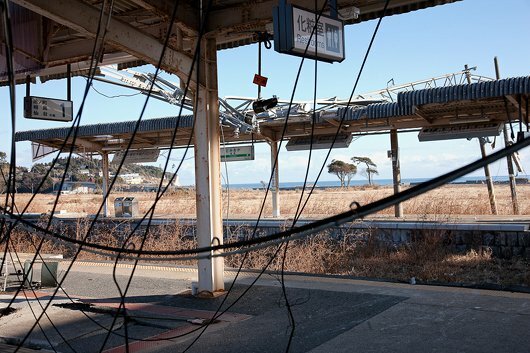 The abandoned Tomioka station, washed away by the tsunami on March 11th 2011. Decisions based on emotions (such as fears) have no place in this world of politics (for Arendt, these belong to the animal sphere of the human, which she calls the sphere of “zoe”, pure biological life, which represents the sphere of reproduction). The total exclusion of the emotional-intuitive side of the human being, however, has led to a paradoxical situation in modern democratic societies. On the one hand, based on constantly sinking voter participation, the citizens of these societies are often accused of political apathy. On the other hand, we increasingly bear witness to highly emotionalized eruptions of political protest, whether against the reconstruction of a railway station in Stuttgart or growing resistance to the use of atomic energy in Japan. In an awkward attempt to understand these processes, the mainstream press in Germany described these outrages as one of “enraged citizens” (Wutbürger), while in June 2011 the conservative politician Ishihara Nobuteru described the growing anti-nuclear protest as an outburst of “mass hysteria”. For Giorgio Agamben, the exclusion of the animalistic and emotional side of the human being in political discourse represents one example of what he calls the "anthropological machine“ (namely a “fundamental metaphysical-political operation in which alone something like 'man' can be decided upon and produced”) by defining the human as precisely not-animal. Accordingly, it’s already the discursive division between the human (rational) and the animalistic (emotional) side of the human that is political itself, not just the “human” sphere of politics defined by Habermas as deliberative democracy. Against the background of Agamben’s and Mouffe’s critique of the contemporary shape of politics, I would like to draw attention to an approach proposed by Japanese cultural critic Azuma Hiroki. In a recently published book, Azuma attempts an intervention on the shape of the contemporary political system, based on the consensus-oriented model of deliberative democracy. As we can already learn from the title Ippan ishi 2.0, Azuma’s approach is based on a re-reading of Jean-Jacques Rousseau’s political concept of the “general will”. The general will, in Rousseau’s political thought, is something completely different from a consensual will based on deliberative discussions in a public sphere. It is spontaneous, natural and unthinking. In Rousseau’s idea of a democracy based on the general will, it is the consensus of the heart (as Habermas has called it in his critique of Rousseau) that takes precedence over that of argument. Azuma suggests that today, in a time when people constantly express their most animalistic wishes, needs and fears via the internet at social network sites such as Twitter, Facebook or its Japanese counterpart mixi, the general will (the "sum of differences“ within a society, as Rousseau tried to explain his concept in simple mathematical terms) in the digital age has already found channels to express itself which weren’t in existence at the time Rousseau formulated the concept. This contemporary condition, described by Azuma as "ubiquitous recording society“ (sōgo-kiroku shakai), allows for different political approaches to rumours as well. Formerly being transmitted via mouth-to-mouth communication, and therefore being a fleeting, temporal phenomenon that leaves no traces, rumours nowadays circulating via the Internet leave complete records of their origin, content and ways of dissemination. Using a term Azuma frequently applies to describe the postmodern condition of cultural production and reproduction since the publication of his well-known book on the otaku in 2001, he argues that in our days the general will has assumed the shape of a gigantic digital "database“ (dētabēsu). From this database of ubiquitously and constantly expressed emotions, one could, according to Azuma, with the help of the very latest computer software identify "unconscious patterns of needs“ (or "latent public opinions“, as Shimizus called it) that add up to the manifest and obvious political discourse in any given society. Computationally processed and visualized, Azuma concludes, the Internet for the first time in the history of democracy has created a general will 2.0 which now necessarily has to be included into political decision-making processes. Against this background of Shimizu’s definition of rumours and Azuma’s idea of the general will 2.0 and its visualization, the Japanese government’s latterday strategy of monitoring rumours at first sight might appear as an appropriate counter-strategy against the rampant circulation of rumours. However, the way the government (i.e. the advertising agency) is trying to respond to the results of the monitoring is highly questionable. Instead of taking the fears of the people seriously, it is the strategy of the government to aim at suppressing their anxiety and needs by providing what the government itself considers as “appropriate” information. Thereby, the government reveals a strategy which is not responding to the animalistic needs of the people, but one that tries to counteract these with (supposedly) more rational information – although it is highly uncertain if one can fight existential needs or a struggle for survival with rational arguments. Accordingly, instead of eliminating rumours (whether it be by means of censorship or monitoring and anti-PR-strategies), the government needs to take up a strategy taking the fear expressed in rumours seriously into consideration when making further political decisions. As long as the government remains within this pattern of appropriate or inappropriate information (defamations and other violations of the laws are naturally not up for discussion here), it will not be able to deal with the problem of rumours effectively. Despite the fact that one couldn’t agree less with the neo-liberal tendencies (such as the proposition of a minimal state) in Azuma’s approach, yet one could also not agree more to his suggestion that something like a digitally visualized general will 2.0 exists today and that this could provide what Chantal Mouffe has called a “channel through which collective passions could be given ways to express themselves over issues.” A digital visualization of the invisible could be considered as a visualization of the non-represented, invisible “share of the shareless” (Jacques Rancière) understood as not merely models “of something” (in the sense of a representation), but “for something”, namely procedural scripts of idealistic-Kantian “regulative ideas” as a source for the formulation of alternatives to a contemporary society supposedly without any alternatives.